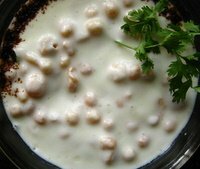 Boondi Raita is a Indian raita recipe made from yogurt and small balls made of gram flour. You can easily get these in Indian shops, they are known as 'boondi'. You can even make these at home. Mix the gram flour (besan) and salt in a bowl. Slowly add water and mix well using a balloon whisk. Keep adding water till it reaches a thin pan cake batter/dosa batter consistency. Add red chili powder and chat masala if you want. Now heat oil in a deep pan/ kadai. Using a strainer with big holes or a slotted spoon (with round holes), pass this batter through the holes into the oil. Fry till the drops become golden brown. With another slotted spoon, drain on kitchen paper. Allow to cool. Store in a air tight container. Add boondi to warm water and let it stand for 2-3 minutes so that it becomes soft. Then very gently pick a handful at a time and squeeze the water from it. Put it in a bowl. Lightly whisk the yogurt until smooth. Add salt, black pepper powder and chili powder. Mix well. Pour this on the boondi and gently stir to mix. Sprinkle roasted cumin seeds powder on the top. Chill in the refrigerator. Garnish with chopped coriander leaves. Serve chill. Enjoy!